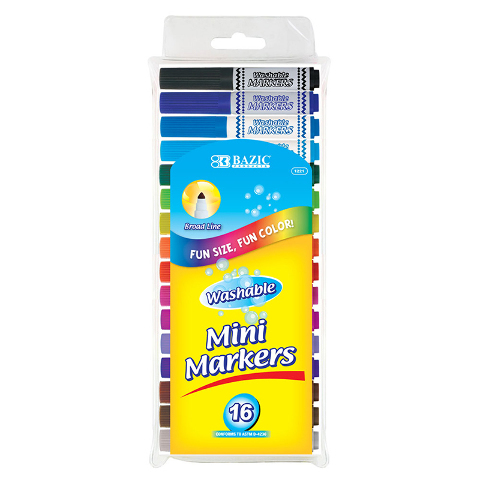 This set of washable markers is perfect for coloring and drawing. 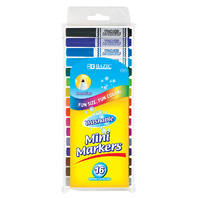 Includes 16 different colors: pink, orange, red, yellow, green, brown, black, blue, light pink, purple, plus, lime, light blue, light brown, gray, and violet. Conical fiber tips (like a cone shape) allow the artist to draw fine line when using the tip in vertical angle, and broad line when using the tip in tilted angles. Mini size: 5/8" in diameter, 4" long [when capped]; 3 1/4" long [when uncapped]. Wash & Care tips: most clothing can be washed in warm or hot water. Do not use pre-wash or chlorine bleach, repeat laundering if necessary.